Like with most anthologies, there were stories I absolutely loved and some I didn't like at all. Overall I enjoyed reading it, but it was a super mixed bag for me.Individual thoughts:A Familiar Tale - I'm not a talking animal person, but this was cute and fun.Room 517 - This was a lot of fun to read! Comedic and ridiculous and surprising, and can I please visit that hotel? It was everything! A Witch in Charm City - This was too cute for me personally, but I can't lie - that ending forced a smile from my cold, cold heart.Deathless - I ADORED this story. It was dark and dangerous and descriptive and scared me. I loved it. One of my favorites, for sure. The Apothecary Shoppe - This was fabulous! Twisty and surprising. I felt the danger! Love, love. Another favorite.Forget Me Do - I'm not sure what happened at the end, but I was confused and I didn't like it. Jaded - This wasn't told in a storytelling style I like, but I liked the idea behind it. So, I'm on the fence with this one.The Witch's Pyramid - This was a poem. Poetry is super subjective, but I liked it.Vampire Witch - At this point this e-zine was crashing and burning a little for me. The main character was super unlikeable, and I have no idea what was going on with her dad, but it was gross. The Witch's Mask - No. I absolutely loved the idea for this, but the execution was not great. I don't know what it is. It was just flat and colorless to me. It made me so sad, because the concept is so good! 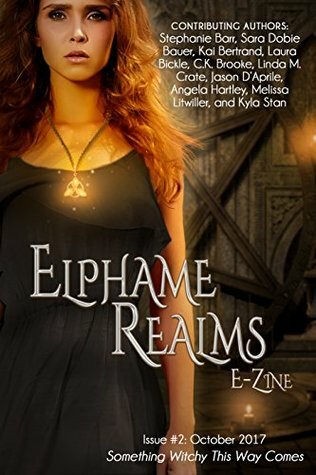 Witches, witches everywhere!This is the second issue of the e-zine and I noticed this one was packed with even more stories than the first. Here we have a nice collection of poetry, author interviews, and short stories, several with a witchy theme but all paranormal in some way.I enjoyed every one of them but I think my favorite was The Apothecary Shoppe. I won't give anything away but I'll say that I thought the ending was a perfect surprise. Gave me a bit of an Edgar Allan Poe moment, I must say.The rest of the stories are a combination of YA or adult and feature lots of witch characters, some with horror story elements (but nothing too graphic), and even a bit of romance. If you enjoy reading about witches, magic, or just paranormal in general, I recommend it. The poem toward the end was also a nice addition. Great October read! C.K. Brooke Stephanie Barr Sara Dobie Bauer Kai Bertrand Laura Bickle Linda M. Crate Jason D'Aprile Angela Hartley - C.K. Brooke is an award-winning, bestselling author of over a dozen romance and fantasy novels and novellas. Her debut novel, THE DUCHESS QUEST, was selected by Shelf Unbound Magazine as a Top 100 Notable Indie Book of 2015, and her YA novel, SECRETS OF ARTEMIS, received the Indie B.R.A.G. Medallion Award in 2017. She is also the author of THE WRONG PRINCE (48fourteen, 2016), a Global EBook Award Honorable Mention title, as well as the historical romance, CAPTURING THE CAPTAIN (Limitless, 2016), which was a RONE Award Nominee and a Finalist in the Mid-Michigan RWA Best Banter Contest. She lives in Washington, Michigan with her husband and son. Visit her at CKBrooke and subscribe for a free eBook.